At home, bedroom is the right place for relaxation as well as for rejuvenation. So some points should be kept in mind while designing a bedroom that is why it looks pretty and glorious which attracts guests. A lot of things like color, flooring, soft furnishings, textures etc can affect at the time of design any bedroom. Soft furnishing add comfort, style and colour whereas beautiful cashmere throws are luxurious and warm. Scented candles add a nice touch of every bedroom. Someone can also use wallpaper to work with the size and shape of your room. Colours can give a good mood to everyone so choosing a good Colour is a big factor for everyone. Blue and green Colour is also good choice for bedroom. If you decide to do complete white walls, it should look good and you have to maintain in a proper way for its long lasting. These Colours exemplify style and evoke a peaceful ambience. Monochrome accents work well with white bedrooms. 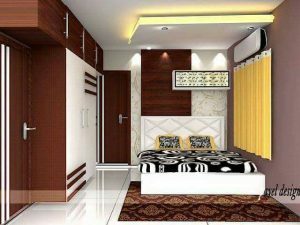 Bedroom should be Colourful and decorate enough that it can highlights its special appeal of its. Plush carpets work well for bedrooms. Vinyl and laminate flooring are also options worth considering for the bedrooms. 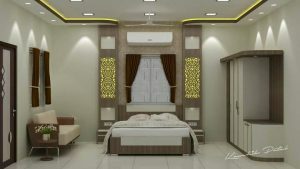 Furnishing is also a great factor for bedroom designing. Beds with storage space are also good for smaller bedrooms. Modern bedrooms are featured with different types of colours and neutral tones of grey, white and black, all serving as simple, base colours. Floral printed bedroom wallpaper works well on feature walls. Pine or all white furniture is popular choices for the country choice. Aged wood fits the industrial look well, as do exposed pipes and ducts for the warehouse look. Scandinavian style bedrooms are characterised by their simplicity, functionally and elegance. Soft lighting is an important element for this style of bedroom. 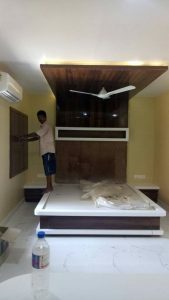 WEST INTERIORS designer offers you end to end solutions for interior design services for bedrooms. So if you need any assistance just go through our office address along with our phone number.